Join us for this “open house style” celebration event on Monday, April 10, 2017 from 9:30 a.m. to 12:00 p.m. in the James M. Grant Student Life Center. Enjoy donuts and coffee as you stop in to receive your cap and gown, grab your yearbook, and pick up your Alumni gifts. We will also be raffling off “Priority Reserved Seating” certificates that will enable your guests to have some of the best seats in the house along with other exciting prizes! Note: This is a mandatory event for seniors graduating in Spring 2017. A Dutch Bros coffee truck will be on the scene for you to enjoy! Graduates have the opportunity to earn “Hawk Bucks” to be used toward the purchase their coffee. The “Hawk Bucks” will be distributed at various tables at this Grad Finale event so make sure to visit each area to receive up to $3 off of your drink (for graduating seniors; $1 off for juniors). The Registrar’s Office will be present to hand out your caps and gowns. At this stop, you will be asked to fill out a brief survey and be able to pick up your alumni gifts. Swing by to pick up your complimentary yearbook. Step on up to the photo booth to capture memories of this special time! Props are provided – Just grab your fellow graduates and strike your poses! A representative from the Enrollment Department will be present to answer questions you may have regarding Simpson University’s graduate programs. A representative from the Registrar’s Office will be present to take note of any graduation accommodations your guests may have. 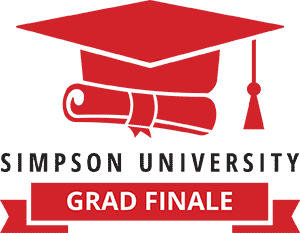 This is the final day to report accommodations for graduation. Seniors graduating in Fall 2017 and juniors – come and get your graduation questions answered.